This easy Vegan Lemon Tart recipe with Coconut Crust and Coconut Whipped Cream is perfect for Easter or Mother’s Day Brunch! This Vegan Lemon Tart with Coconut Crust is THE BEST dairy-free lemon dessert! Spring is waiting around the corner and with it all those gorgeous lemon desserts! Guys I don’t know about you but I am SICK of Canadian winter! Luckily, I have kinda made escape plans and will be heading to Tulum in a couple of days. YES, bye bye winter! After some intense sunbathing in Tulum, I plan on spending the next 5 months at our home in Merida, Yucatan. The most amazing city EVER – you guys should totally put it on your to-visit list! The food alone is insane and I will annoy you with a lot of tacos and margaritas on my Instagram! Follow me on Insta to keep posted on my vida loca. Alrighty, it’s time for a serious Lemon Tart, friends! 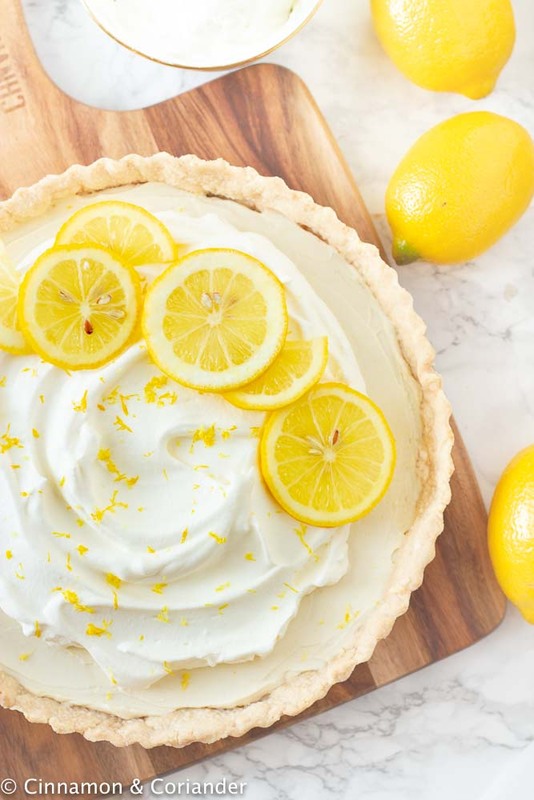 This vegan lemon tart recipe is a total must-try for lovers of citrus desserts! It’s less a lemon curd tart, but more like a vegan lemon mascarpone tart, if that makes sense. Very creamy and silky with just the right amount of tartness and sweetness. The base for this Vegan Lemon Tart recipe is a vegan shortcrust pastry made with coconut oil. Hands down the easiest pie crust / tart crust you will ever make! Guys, this is a no-sweat no-mess kinda dessert. All you have to do in advance is soak your cashew nuts. But even if you forget, there’s a shortcut I’ll mention in the tips section. The egg-less lemon tart filling is a simple mix of coconut milk, coconut oil, cashews, lemon zest and lemon juice. I sweeten my vegan tart filling with Stevia as maple syrup makes it a bit darker in color. Pour that mixture into your pre-baked coconut crust and your vegan lemon tart is ready for the fridge! For all of you who are still looking for a good fool-proof recipe for vegan pie crust or vegan shortcrust pastry, this vegan coconut crust is the one! It’s SO SIMPLE, you’ll laugh! But bear with me because this one is a keeper! While regular all-butter shortcrust pastry tends to shrink while baking, this one holds up so well that I am using it for all my non-vegan bakes as well. I made this Raspberry Curd Tart the other day using this coconut oil crust recipe and everyone loved it! If you don’t want your vegan shortcrust pastry to taste like coconut, use refined coconut oil. This is what I did for this recipe. Tips for making the best Vegan Lemon Tart! This recipe makes a regular 11-inch tart pan, but you could use mini tart shells as well. We use lemon zest in this recipe! Make sure you remove pesticides from your lemons – I also do this with organic lemons. All you have to do is fill a large bowl with 4 parts water to 1 part plain white vinegar. Soak your lemons in the mixture for 20 minutes. Rinse with water. If you forget to soak the cashews the day before, there’s a short-cut! Bring a small pot of water to a boil and pour the hot water over the cashews. Let them soak in the hot water for 1-2 hours then drain and rinse. for a sugar-free version instead of maple syrup! I made this vegan lemon tart recipe with orange juice and zest and with grapefruit and both worked out really well. If you go for a vegan orange tart, add some cinnamon to the vegan shortcrust pastry! SO GOOD! Vegan Grapefruit Tart goes especially well with some Chai spice in the crust. Instead of a tart, you can also make vegan lemon bars. Use the crust recipe from my Vegan Nanaimo Bars instead of the vegan shortcrust pastry. I liked the natural look of my lemon tart but if you want a really bright yellow color, you could possibly add just a couple drops of food coloring to the lemon filling! Can I make this Vegan Lemon Tart ahead of time? I find that this vegan tart holds up pretty well and the coconut crust will not get too soggy once stored in the fridge. However, for best results, I recommend you make the vegan shortcrust pastry in advance and add the filling the day off. Coconut cream does not hold up very well so make sure to whip that up last minute. Stored in the fridge, it will keep for at least 1 week. ★ Did you make and love this Vegan Lemon Tart recipe? Give it your review below! And make sure to share your creations by tagging me on Instagram! This easy Vegan Lemon Tart recipe with Coconut Crust and Coconut Whipped cream is perfect for Easter or Mother's Day Brunch! Soak the cashews in cool water and refrigerate overnight. Preheat oven to 350 degrees F. Lightly grease a tart pan with removable bottom and set aside. In a large bowl, stir together the AP flour, melted cooled coconut oil, and powdered sugar until well combined. The dough will be stickier than your regular shortcrust pastry but fairly easy to transfer. Roll out and transfer to the greased tart pan and press evenly into the sides and the bottom of the tart pan. Place the tart on a baking sheet and freeze for 5 minutes, while the oven heats up! Bake for 25 to 30 minutes, until the crust is starting have a gorgeous golden brown look. Remove from the oven and let cool. Rise and drain the cashews. Place them in your high-speed blender along with coconut milk, lemon zest, lemon juice, stevia, coconut oil, and salt. Blend until very smooth and creamy. Pour this mixture into the cooled coconut crust, and smooth out using a spatula. Refrigerate the lemon tart for 2 hours or until set. Top with coconut whipped cream (see below) or coconut yogurt. Open your refrigerated can of coconut milk! Scoop the coconut cream that gathered on top out and place it into a bowl along with the salt, maple syrup or coconut sugar. Whip with a hand mixer. Add a tiny bit of the leftover coconut water if the mixture does not come together. 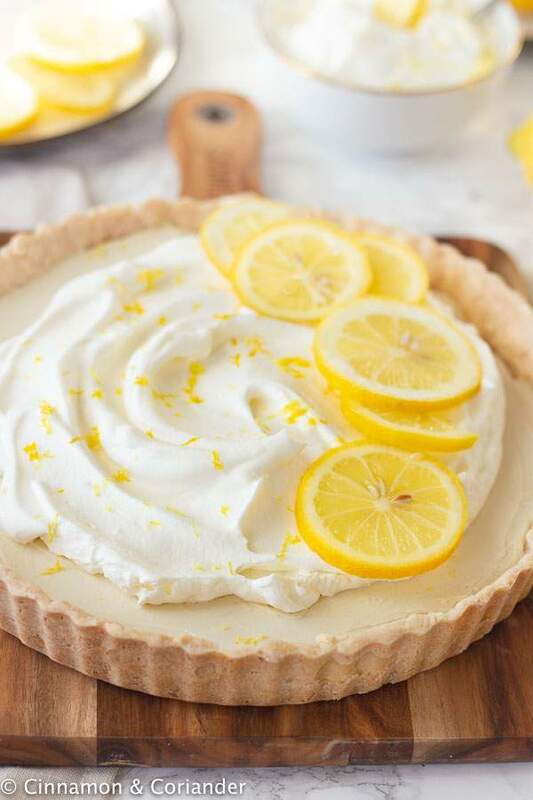 Decorate your tart with coconut whipped cream and lemon zest! Fresh lemon slices or/and berries are a nice touch also! We use lemon zest in this recipe! Make sure you remove pesticides from your lemons - I also do this with organic lemons. All you have to do is fill a large bowl with 4 parts water to 1 part plain white vinegar. Soak your lemons in the mixture for 20 minutes. Rinse with water. If you forget to soak the cashews the day before, there's a short-cut! Bring a small pot of water to a boil and pour the hot water over the cashews. Let them soak in the hot water for 1-2 hours then drain and rinse. 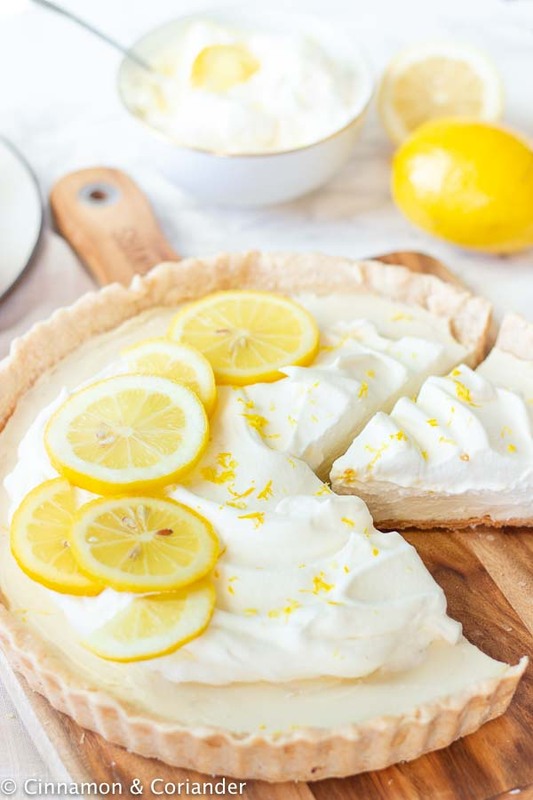 I love lemon and this tart looks so delicious! Sometimes when I see something that’s vegan, it doesn’t look as good as the non-vegan item! That is not the case with this lemon tart! It looks and sounds outstanding. Thanks so much, Elaine! As I am not living strictly vegan myself I am a pretty harsh critic and I am actually preferring this one over regular lemon tarts! Thanks so much for stopping by! I can’t quite believe this is vegan – it looks so creamy! I’m a sucker for lemon desserts, can’t wait to try this! what a gorgeous tart! i am tired of winter too, granted i am in san diego winter, but still LOL. Lemons are in full bloom here and just love this time of year with all the lemon desserts! Oh, your early spring sounds absolutely lovely! Thanks, so much for stopping by! I can’t believe it’s vegan. This looks absolutely delicious. I cannot wait to give it a try and surprise everyone. Thanks for sharing. Coconut and lemon pair so well together! I love how the creaminess of coconut brings out the best in citrus. This tart looks absolutely delicious and is really pretty too! My husband loves lemon desserts! I wish I had seen this before Valentine’s Day so I could surprise him. I love that you use coconut oil too because I have a huge jar of it and I’m always looking for great recipes like this to use it with. Great post! It’s that time of year when winter seems like it’s not going to end! This tart would brighten my day if I had a bite of it. What a beautiful tart! and I would never think that it’s vegan…) I’ve been trying to find more healthy dessert recipes lately and I definitely need to try this recipe! LOVE it! This sounds like the perfect summertime treat that could be enjoyed year around. This looks so creamy and delicious! It’s great that you’ve created a vegan version that looks like it’s just as tasty as the dairy version!! 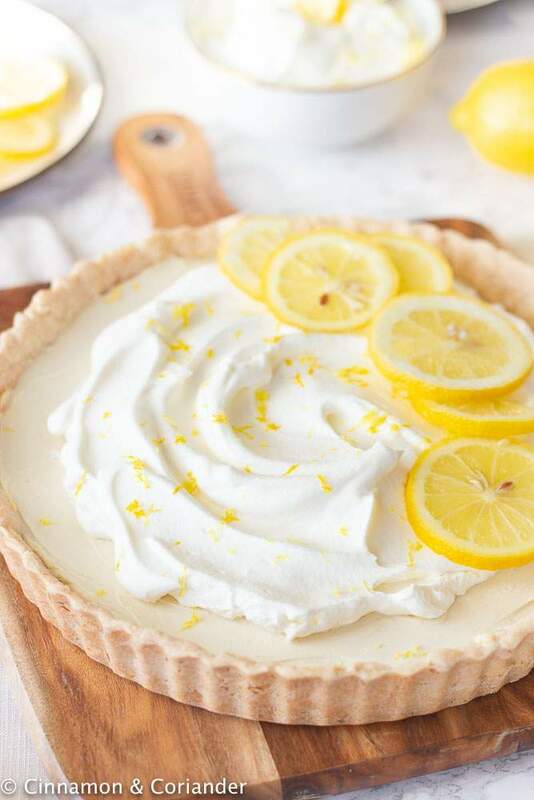 What a gorgeous and refreshing vegan lemon tart, a perfect dessert for any occasion! Ein tolles Rezept! Es liest sich schon richtig gut. Hallo liebe Silke! Das freut mich sehr! Ganz liebe Grüße! By coconut milk for the cream base, do you mean canned coconut milk or the boxed kind like silk almond / cashew etc? ?